(29.5 cm), xlii, 390, (2) pp., 33 colour plates, 181 black & white text illustrations. Publisher’s cloth, leather spine label; original slipcase (no dust jacket issued). - A catalogue of historically important books in the history of medicine, based on an exhibition held at The Grolier Club, 20 September-23 November 1994, conceived and organized by Haskell Norman. The materials described were borrowed from various collections. The bibliographical descriptions are accompanied by essays commissioned from twenty-three experts. Printed in an edition of 1500 copies by the Stinehour Press. 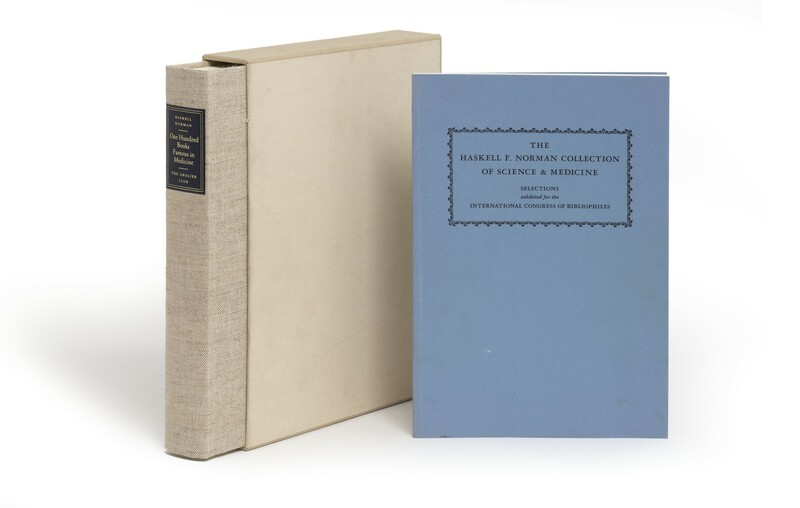 Association internationale de bibliophilie, The Haskell F. Norman Collection of Science and Medicine: selections exhibited for the International Congress of Bibliophiles. San Francisco: Jeremy Norman & Co., 1985. - “This was HFN’s personal choice of his favorites from the library” (Jeremy Norman). ¶ Fine copies. (29.5 cm), xlii, 390 (4) pp., 33 colour plates, 181 black & white text illustrations. 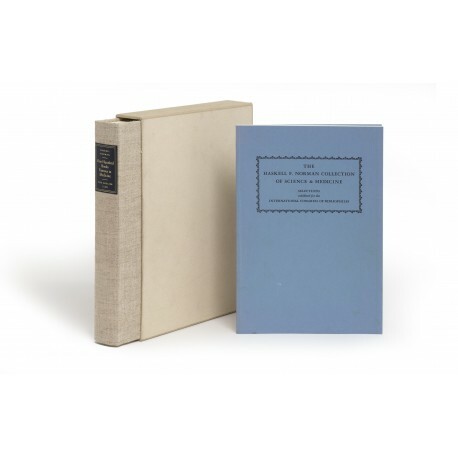 Publisher’s cloth, leather spine label; original slipcase (no dust jacket issued). - Designed by Jerry Kelly and produced by the Stinehour Press in an edition of 1500 copies. For Jean Grolier & His Friends: 125 Years of Grolier Club Exhibitions and Publications, 1884-2009 (New York 2009), P367. ¶ Fine copy. Prospectus loosely inserted. (28 cm), 44 pp., illustrations. Publisher’s printed wrappers. - 123 catalogue entries (prepared by Diana H. Hook). Designed by Andrew Hoyem and produced by the Arion Press in an edition of 1000 copies. ¶ Fine, unmarked copy.